Long before Words With Friends (WWF), there was its real-world ancestor Scrabble, which we’ve been playing in our family for as long as I can remember. At home we use a set with indentations that keep the letters in place, and a fancy turntable to spin the board to each player. We have one travel set we bring to the beach and another we take with us when we know we’ll be waiting on line at a restaurant for more than a half hour. 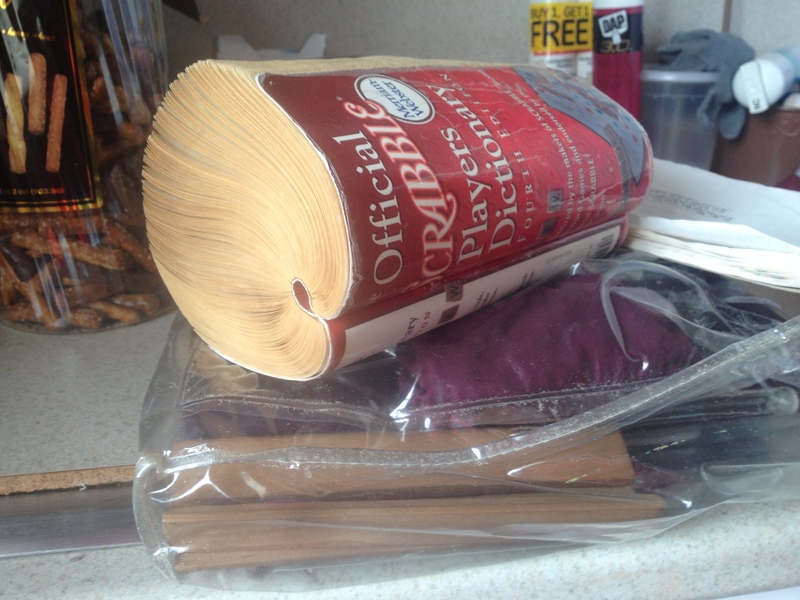 Our paperback Scrabble Dictionary for the beach is so warped from the humid ocean air, its spine has curled into a sharp u-shape. In fact, we’re on our second beach board because the first one partially melted from years in the hot sun and wouldn’t lay flat any more. Oh yeah; we’re total Scrabble geeks. WWF is essentially the same game except that with Scrabble, you compete against human beings who are sitting beside you, in person, rather than communicating over the Internet. In WWF the program automatically decides which words are permissible, while in Scrabble the issue is open to discussion. To settle disputes about what words are acceptable, we always use an Official Scrabble Dictionary, which features “aa,” “mu,” “za,” “ae,” and similar obscure – but handy – language fragments. 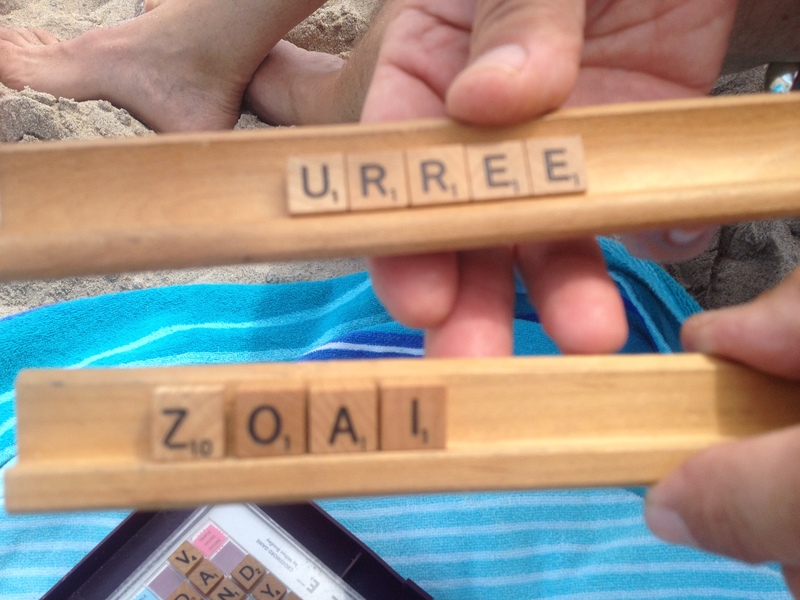 Two weeks ago Maria and I played a game on the beach to a point where neither of us could build any more words, even though we both had letters left in our racks. I passed on my turn; she passed on hers. 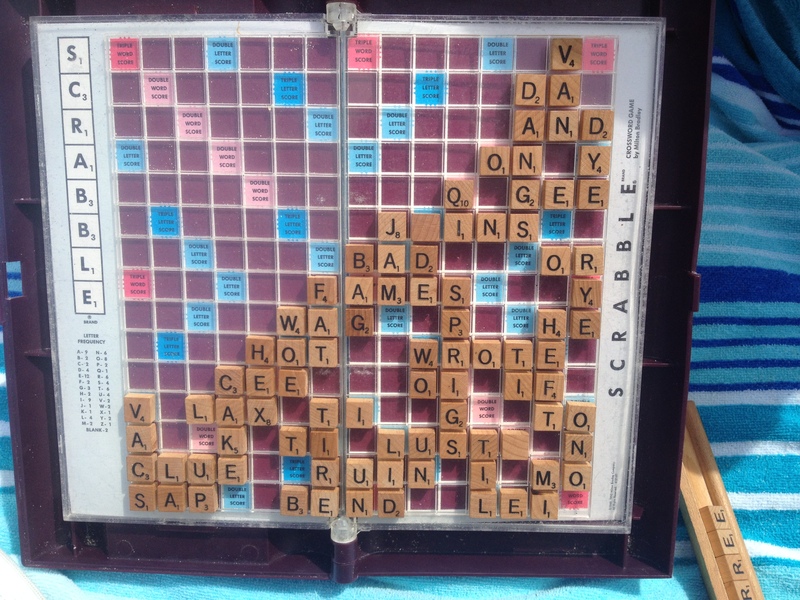 We’d never seen it before: the Scrabble stalemate. What would you do with this board? We shrugged and showed each other our letters (an interaction impossible in WWF). Mine were pretty crummy (U, R, R, E, and E), and Maria’s weren’t much better except for the high-value Z (accompanied by O, A, and I). Neither of us could come up with any words, so we declared it a tie and put the game away – but we were wrong. Even though a stalemate is as rare as the elusive ai (a Venezuelan three-toed sloth), the Official Scrabble Rules clearly provide that if all players “pass” twice in a row, the game is over and the points must be tallied. You subtract from each player’s score the value of the tiles remaining in that person’s rack, and whoever has the highest score wins. That person was Maria – again. She regularly beats me at WWF too, but those games are a lot less fun than our Scrabble matches, where we can squabble about the rules and whether or not a given word is acceptable. We (me, usually) grouse about having six vowels, taunt the other person for taking too much time, and share the excitement (or envy) when one of us gets a seven-letter word. Despite its name, WWF is an impersonal electronic interaction that’s mostly about words. Scrabble, on the other hand, is all about gathering people together in the same place to match wits and share a few laughs – truly a game of words, with friends.